The physical setting for life on the island is dominated by the mountain masses and the central plain they encompass, the Mesaoria. The Troodos Mountains cover most of the southern and western portions of the island and account for roughly half its area. The narrow Kyrenia Range, extending along the northern coastline, occupies substantially less area, and elevations are lower. The two mountain systems run generally parallel to the Taurus Mountains on the Turkish mainland, whose silhouette is visible from northern Cyprus. Coastal lowlands, varying in width, surround the island. The rugged Troodos Mountains, whose principal range stretches from Pomos Point in the northwest almost to Larnaca Bay on the east, are the single most conspicuous feature of the landscape. Intensive uplifting and folding in the formative period left the area highly fragmented, so that subordinate ranges and spurs veer off at many angles, their slopes incised by steep-sided valleys. In the southwest, the mountains descend in a series of stepped foothills to the coastal plain. While the Troodos Mountains are a massif formed of molten igneous rock, the Kyrenia Range is a narrow limestone ridge that rises suddenly from the plains. Its easternmost extension becomes a series of foothills on the Karpas Peninsula. That peninsula points toward Asia Minor, to which Cyprus belongs geologically. Even the highest peaks of the Kyrenia Range are hardly more than half the height of the great dome of the Troodos massif, Mount Olympus (1,952 meters), but their seemingly inaccessible, jagged slopes make them considerably more spectacular. British writer lawrence Durrell, in Bitter Lemons, wrote of the Troodos as "an unlovely jumble of crags and heavyweight rocks" and of the Kyrenia Range as belonging to "the world of Gothic Europe, its lofty crags studded with crusader castles." Rich copper deposits were discovered in antiquity on the slopes of the Troodos. Geologists speculate that these deposits may have originally formed under the Mediterranean Sea, as a consequence of the upwelling of hot, mineral-laded water through a zone where plates that formed the ocean floor were pulling apart. Deforestation over the centuries has damaged the island's drainage system and made access to a year-round supply of water difficult. A network of Winter Rivers rises in the Troodos Mountains and flows out from them in all directions. The Yialias River and the Pedhieos River flow eastward across the Mesaoria into Famagusta Bay; the Serraghis River flows northwest through the Morphou plain. All of the island's rivers, however, are dry in the summer. An extensive system of dams and waterways has been constructed to bring water to farming areas. The Mesaoria is the agricultural heartland of the island, but its productiveness for wheat and barley depends very much on winter rainfall; other crops are grown under irrigation. Little evidence remains that this broad, central plain, open to the sea at either end, was once covered with rich forests whose timber was coveted by ancient conquerors for their sailing vessels. 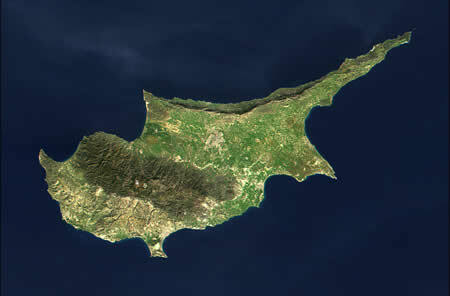 The now-divided capital of the island, Nicosia, lies in the middle of this central plain. The natural regulation for the life in the island is dominated by masses of mountains and the central plain that covers, the Mesaoria. The mountains Troodos cover the bigger part the southern and western portions of island and constitute at approach his half region. The narrow line Kyrenia that are extended at length of northern coast occupies the substantially less region, and the elevations are lower. The two systems of mountains run generally parallel in the Taurus Mountains in the Turkish continental country, which outline of is visible from northern Cyprus. Coastal flat that varies in the width surround the island. The rugged mountains of Troodos, the main line is extended by the point Pomos in north-western almost in the gulf Larnaca in the east, it is the single more distinct characteristic trait of landscape. Intensively and the diploma in the formative period left the region that was chopped particularly, so the inferiorly lines and the stimulations they turn far in a lot of corners, their bents that were engraved from abrupt-frame valleys. In the south-western point, the mountains go down in a line of walked hills in the coastal plain. While the mountains Troodos are a mountainous volume that is shaped the rock of fire, the line Kyrenia is a narrow ridge of limestone’s that is increased suddenly by the plains. Her south extension becomes a line of hills in the peninsula Karpas. That peninsula shows to the Asia Minor, in which Cyprus belongs geological. Even the higher peaks of line Kyrenia are afterwards violence more from half height of big dome of mountainous volume Troodos, place Olympus (1.952 metres), but their ostensibly inaccessible, toothed bents them render enough more spectacular. The British writer lawrence Durrell, in the bitter lemons, wrote the Troodos as "unlovely jumble the rocks and the heavy weights of rocks" and line Kyrenia as belonging "in the world of Europe, his high rocks that were fixed with the castles of crusaders." The rich deposits of copper were discovered in the antiquity in the bents of Troodos. The geologists think that these deposits can have shaped initially under the Mediterranean, consequently the of waters the boiling hot, mining-charge water via a area where the dishes that shaped the ocean floor pulled villages. The deforestation at the duration of centuries has harmed the system of desiccations of island and the access in a at all the duration of time supply of water difficult. A network of wintry rivers is increased in the mountains Troodos and outside from in all the directions. The Mesaoria of is his agricultural heartland island, but productiveness for the wheat and the barley depends too much from the wintry rainfalls other harvests is increased under the irrigation. Few elements remain that this wide, central plain, open in the sea in each one end, was covered a time with the rich forests which timber of was from the ancient conquerors for sailing their ships. The now-divide capital of island, Nicosia, is found in the middle of this central plain.